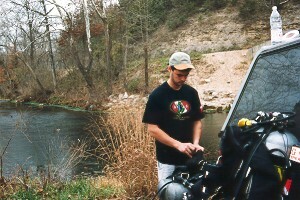 Probably the most popular cave dive is in Roubidoux Spring, Waynesville (Mo) due to its easy access. ALL DIVERS must restister at the Pulaksi County Sheriff's department, From the station, turn right and to the park entrance, follow the road for about a half mile and turn right and park directly next to the spring. There is room for about eight vehicles with additional parking available on top of the little hill. After entering the cave one finds himself/herself in a large cavern zone, ideal for cavern divers. The main line begins about 75 feet back and leads into the upper tunnel. After about 350 feet at a depth of 45 feet you reach the drop-off which stairsteps from 45 feet down to about 145 feet and funnels into the gravel pit. At the gravel pit the lower tunnel begins and goes for about 1200 feet at an average depth of 150 feet until it ends in which is called the Big Room where the bottom drops to a depth of 165 feet. The permanent line continues on to what is called the Second Big Room. Before attempting the first Big Room one has to understand that the lower tunnel has only an average height of 4.5 feet and due to its depth penetrations into the lower tunnel carry a high decompression obligation. At a temprature of around 50 degrees Fahrenheit this needs to be taken into consideration when planning a dive in Roubidoux Spring. Deep penetrations into the lower tunnel are best accomplished using scooters, unless you like long decompression times. Visibility ranges from 20 to 70 feet, depending on the amount of rain the area has experienced. The flow is usually dependent upon the same factor. During the summer months excellent visibility with little flow can be expected. After completing the day's diving do not forget to sign out at the Sheriff's department. Interesting Information: Roubidoux Spring rises in the Waynesville, Missouri city park, at the base of a high bluff. 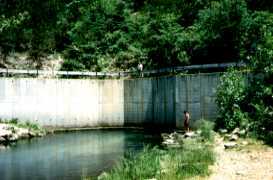 The spring once emerged from a cave opening, but it is now permanently backflooded by a dam built to keep it out of Roubidoux Creek. A large, new retaining wall above the spring helps to maintain the gravel road above from the spring at high flow--the spring and creek have washed the road away more than once. In flood, Roubidoux Spring can reach 200 cfs in flow. Brief History:A succession of private owners until purchased by the city of Waynesville in the last twenty five years. Well known picnic and fishing spot for locals. One of the few places in the state where scuba spring diving is routinely allowed to QUALIFIED and certified cavern or cave divers. 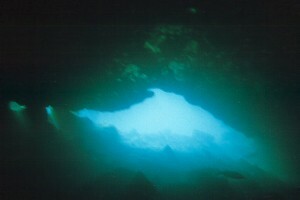 Several dive fatalities have occurred at the location. From Chicago, take I-55 south to St. Louis. Follow the signs to I44 south. Take this to the 1st exit for Waynesville. Turn right on the exit and follow into Wayneville, Downtown on the right side, you will find the Sheriff station. Follow road before Roubidoux Creek Bridge and turn left. Follow to the concrete wall to the spring below. Roubidoux Springs Map Map of Roubidoux Springs. There is lodging available in Waynesville and the nearby towns. Check the list above. Last time there, the 2 local dive shops didn't have air available.